Seven Steps on the Path to a Good Life for People with Disabilities. 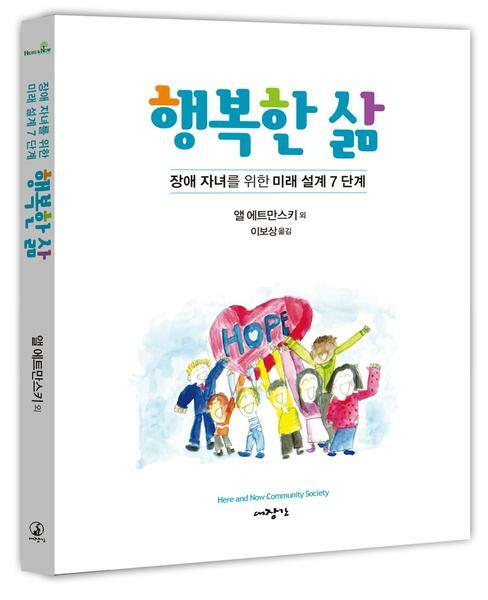 The Safe and Secure Korean Edition is an entirely Korean translation of the 2015 Safe and Secure Expanded Edition. Seven Steps on the Path to a Good Life for People with Disabilities is an inspirational guidebook for parents and other family members who are concerned about the future of their relative with a disability, particularly after the parents are gone. Any parent who has a child with a disability will find their story in the book, plus advice and tips appropriate to their child’s age and circumstance. The book offers a step by step guide to creating a plan for the future which provides for the safety, security and well being of people with disabilities. It leads the reader to look beyond professional social services when creating a safe and secure future. It offers alternatives based on the authors’ personal experiences as parents of children with disabilities. The book is designed to inspire families and motive them to action. The book is resplendent with warm touching stories to illustrate all points. The style is easy to read, thought provoking and funny. At times spiritual, at times philosophical, each step offers timely practical suggestions and useful worksheets. The book also provides information on the Registered Disability Savings Plan (RDSP), housing, advocacy and more. 행복한 삶은 2015년 발간된 Safe and Secure 확장판을 한국어로 번역한 책입니다. 책도 무료로 받으실 수 있습니다. “행복한 삶 – 장애 자녀를 위한 미래설계 7단계”는 장애 자녀의 미래를 염려하는, 특히 부모가 세상을 떠난 후까지 고민하는, 부모 및 가족들에게 영감을 줄 수 있는 안내서입니다. 장애 자녀가 있는 부모라면 누구나 이 책을 통해 자녀에게 도움이 될만한 이야기와 조언 그리고 정보들을 얻을 수 있을 것입니다. 이 책은 장애를 가진 자녀가 미래에도 안전하고 안정되고 풍요로운 삶을 살아갈 수 있도록 준비시켜 주는 단계별 안내서입니다. 독자로 하여금 행복한 삶이라는 것이 단순히 사회복지 서비스에 머무르지 않는 그 이상이라는 것을 알게 해 줍니다. 장애 자녀의 부모이기도 한 저자들은 자신들의 개인적 경험을 기반으로 대안을 제시합니다. 이 책은 가족들에게 용기를 북돋아주고 실제로 행동에 옮기도록 격려합니다. 각 단계의 핵심을 묘사하는 따뜻하고 감동적인 이야기도 들어 있습니다. 읽기가 편할 뿐만 아니라 이런 저런 생각을 하게하기도 하고 웃음을 짓게도 합니다. 때로는 영적이기도 하고 철학적이기도 하며, 각 단계마다 그에 맞는 유용한 워크시트와 실질적인 제안을 담고 있습니다. 이 책은 또한 장애적금(RDSP), 집, 권익옹호 등에 대한 내용도 소개하고 있습니다.